This local 5-piece band includes Michelle Becker (vocals), Joe Benes (guitar), Luke Bundy (banjo and fiddle), Bill Dodd (dobro), Carl Sticklemeyer (guitar), and Tommy Valesky (bass). From bluegrass to R&B, Reunion puts its country stamp on a variety of music. Their sound starts with the vocal talents of Michelle Becker, and adds classic American roots instrumentation. ATTENTION POLKA DANCERS! 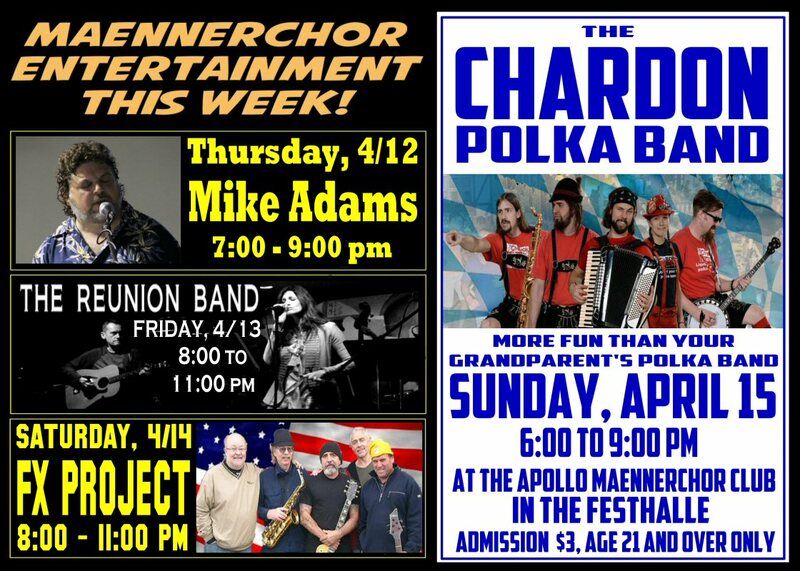 The one and only Chardon Polka Band will be making a special appearance in the Festhalle this Sunday! Cleveland’s high-energy polka band returns! This is a public event, and admission is $3. Sandwiches will be available …and beer, of course! Because, in Heaven, there is no beer.